Thursday’s episode, “The Meteorite Manifestation” was a bit of a departure from recent episodes. As you may have noticed, we did not continue the Super Asymmetry/Nobel Prize plot, which has been driving many episodes this season. Sometimes this happens—and it doesn’t mean we won’t pick it up later! Our writers often write other funny scripts that are slated in between episodes with continuing plots, and this was one of them! 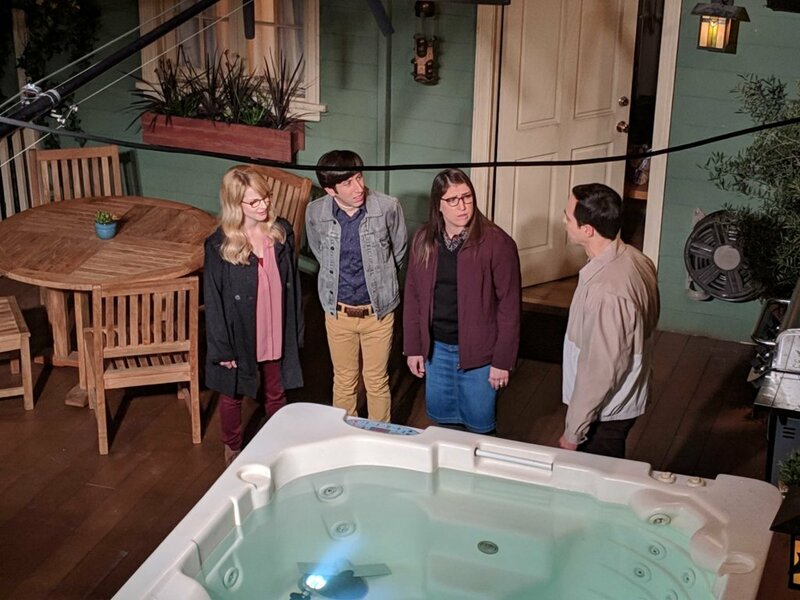 This episode featured Sheldon debating whether to turn in Bernadette and Howard for having a non-permitted deck (and bathroom! ), and Leonard feeling left out as no one wants to use his cool new laser. 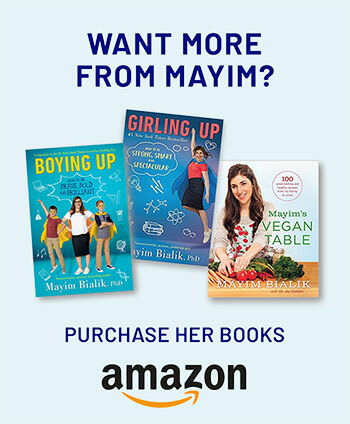 This was a light episode for Amy, but a fun one nonetheless! Notable this week was the presence of Kevin Sussman, Lauren Lapkus, and the wonderful Brian Posehn, all of whom were guests on “The Meteorite Manifestation.” (Kevin is actually a semi-regular, but it’s still like having a guest when he shows up and we get to spend a week together!) We also were honored to have Andy Daly on; he was hilarious as the annoying “zone zone” guy who works for the city. Also notable was the fact that Grok Nation’s very own Natalie Koch, who runs our social media, was in town and hung out with me for the pre-tape day and sat in the audience for the taping. It was really fun having her here—not only because she got to see where I worked (after mostly seeing it in videos, video chats and photos), but it was also special because she has never been to California and I love playing tour guide! I drove her around the WB lot and showed her the Chuck Lorre production offices. 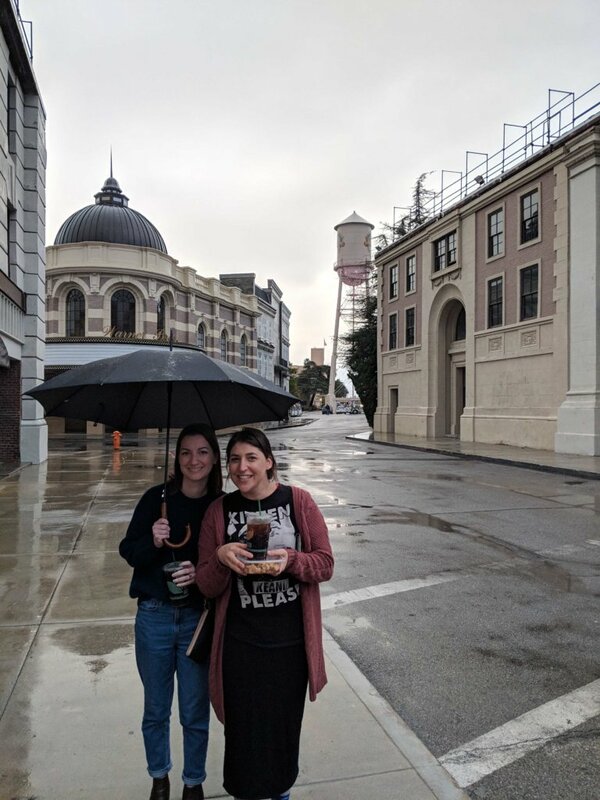 We took a rainy picture in front of the WB water tower, and we even took a trip to the studio commissary, which is actually really fun. 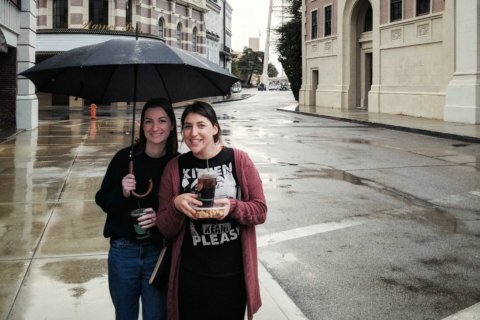 Showing Natalie (“social media human” as I like to call her) the WB water tower on a rainy day. In addition, Natalie got to stay at my house and witness the glory that is the cat heaven I live in. Natalie also got to hang out with my boys, and we even went to Moby’s restaurant, Little Pine, where Natalie was super adventurous. She ate vegan mozzarella balls, “sausage” flatbread, and broccoli “crab” cakes. 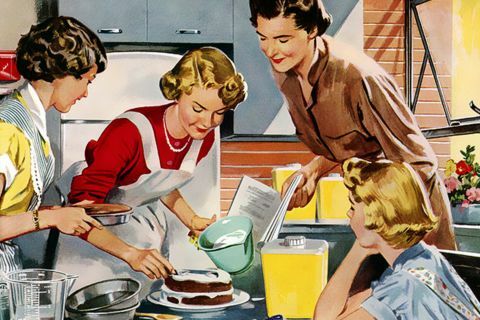 My sons loved her because they talked a lot of Disney together and that’s a shoo-in in their book for adult conversation. Having Natalie see where I work was really special, and even though I didn’t have a lot of stage time, it was really neat having someone I work so closely with get to see behind the scenes of everything I do. She even saw me cry a few times because that’s also kind of something I do. She handled it well. I recovered. All good! 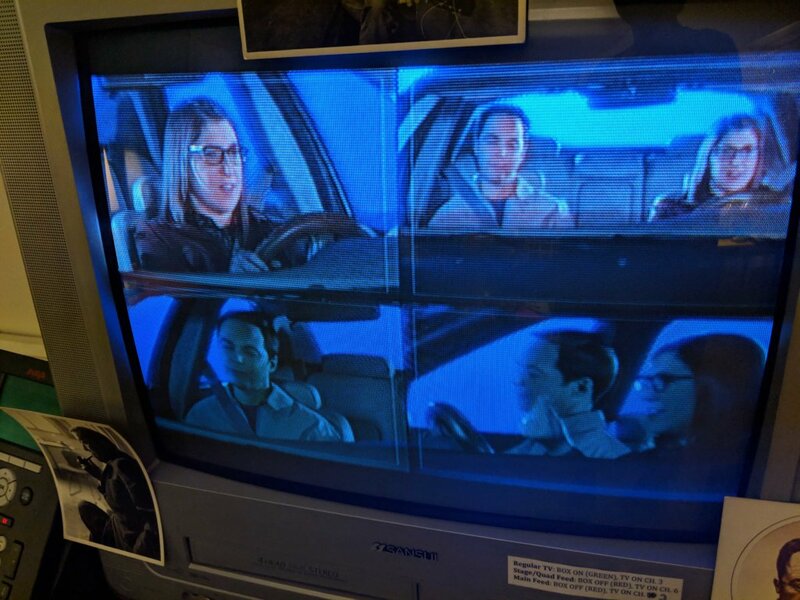 To bring it back to Big Bang Theory, here are a few photos Natalie took while she was on set. I’m not embarrassed to admit: She’s a much better photographer than I am! Natalie snapped this shot on pre-tape day (phones aren’t allowed during the live taping). The little TV in my dressing room, where Natalie watched some of the pre-taped segments. If you’re wondering, I have photos of Bob Dylan, Jean-Paul Sartre (a French existential philosopher) and Albert Camus (a French-Algerian philosopher/writer) taped to my TV. 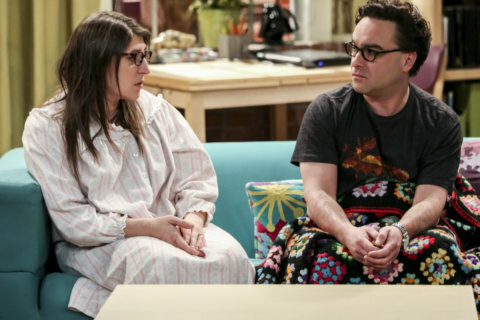 What did you think of “The Meteorite Manifestation”? How jealous are you of Natalie’s backstage look into the episode? Let me know in the comments below! 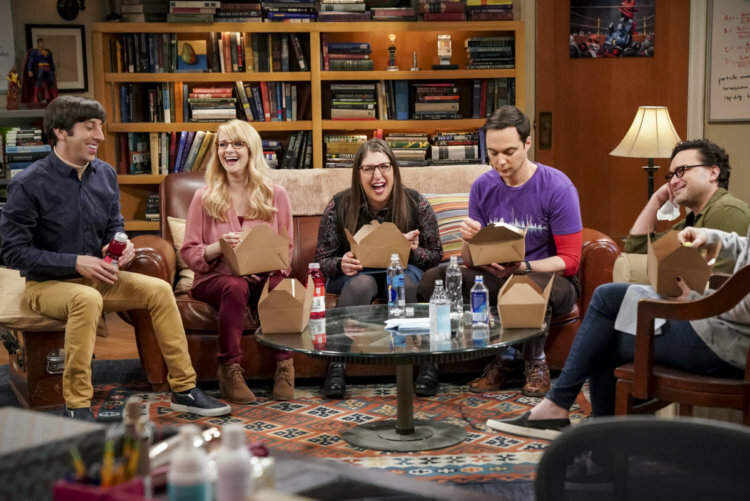 Geeking out with real geeks on 'Big Bang'!